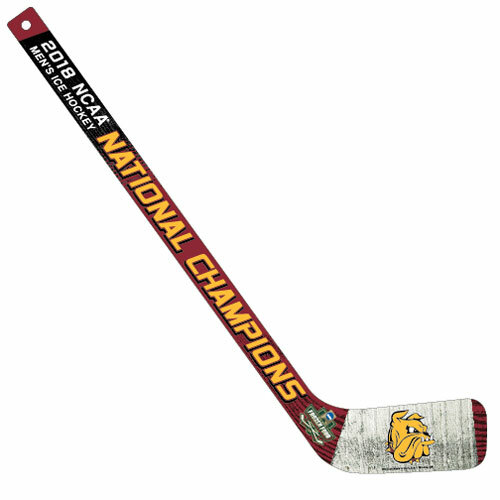 Celebrate the Bulldogs' 2018 National Hockey Championship with this commemorative miniature hockey stick! Features color UMD and National Championship graphics. Measures approximately 24" long. 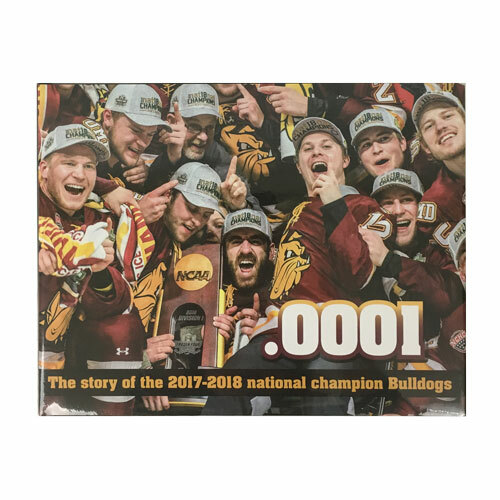 Celebrate the Bulldogs' 2018 National Hockey Championship with this collectible lapel pin! Measures 1" x 1.25" and features the NCAA Trophy and National Championship bulldog graphics. 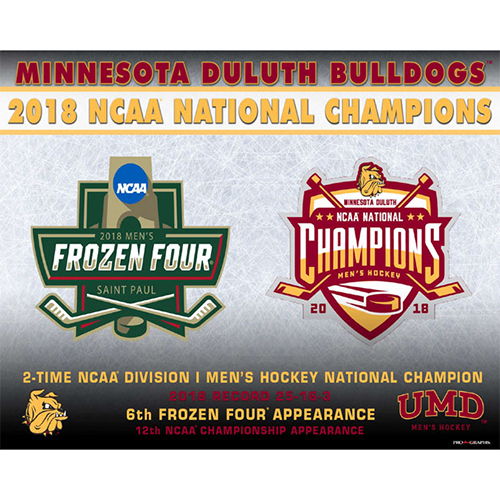 Celebrate the Bulldogs' National Championship win at the Xcel Energy Center in St. Paul with this print from ProGraphs, LLC. 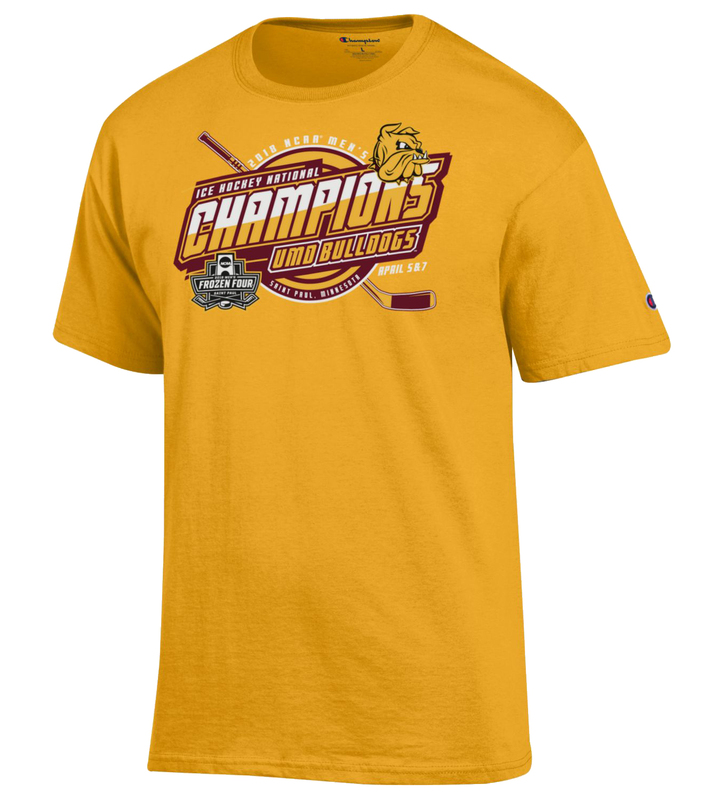 Features the Bulldogs' logo, along with Frozen Four and National Championship graphics. Measures 8" x 10." The book that captures Bulldogs Hockey through their exciting 2017–18 championship season! This 144-page, hardcover book features stories and photos from the prestigious sports writers and photographers of the Duluth News-Tribune. Coverage of regular season and postseason. Collector's item, limited edition. 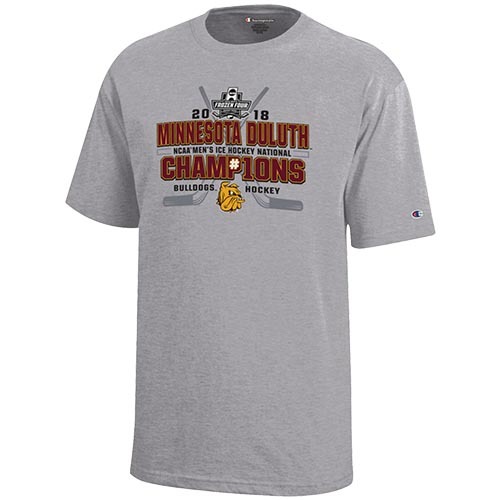 Perfect gift for a Bulldogs Hockey fan! Sorry, no additional coupons or discounts may be applied to this item. The Bulldogs are two-time NCAA National Champions! Celebrate with this print from ProGraphs, LLC. Lists the Men's Hockey 2018 record and number of Frozen Four and Championship appearances. 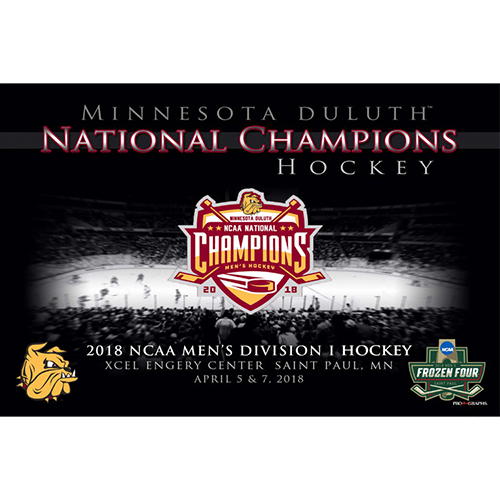 Features UMD, Frozen Four, and National Championship graphics. Measures 16" x 20." 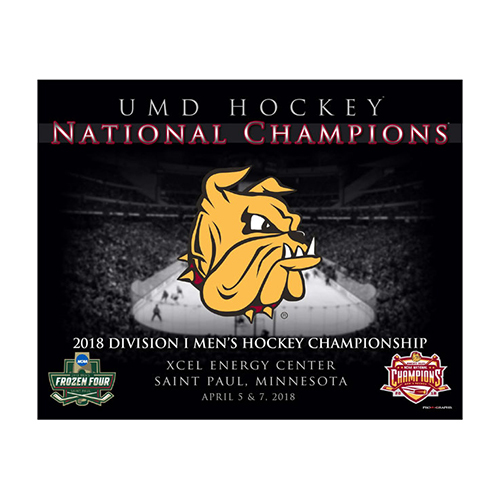 Celebrate the Bulldogs’ 2018 NCAA National Hockey Championship at the Xcel Energy Center in St. Paul with this poster from ProGraphs, LLC! 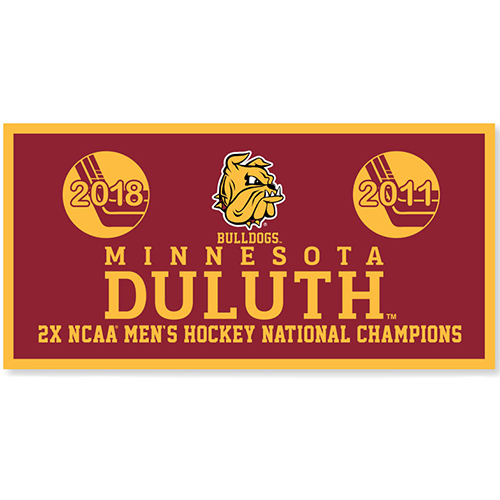 Features the Bulldogs' logo, Frozen Four, and National Championship graphics. Measures 24" x 36." 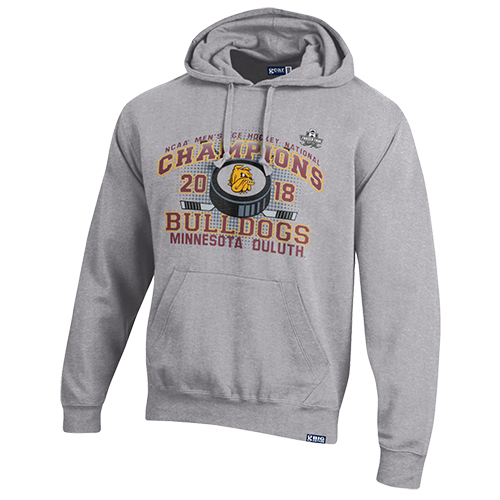 Celebrate the Bulldogs’ 2018 National Hockey Championship with this "Big Cotton" hooded sweatshirt from Gear for Sports. 80% cotton/20% poly 9 oz. fleece with a cotton/spandex rib at cuff, waistband and pocket openings. Features a jersey lined hood, draw cord and front pouch pocket with UMD and National Championship screenprinted graphics. 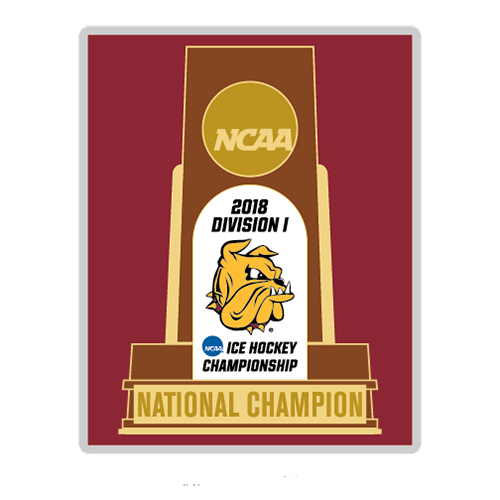 Please select option for NCAA 2018 Hockey Championship Bulldogs Hood by Gear. Celebrate the Bulldogs’ 2018 National Hockey Championship with this "Big Cotton" crewneck sweatshirt from Gear for Sports. Comfortable 80% cotton/20% poly with cotton/spandex rib at collar, V-notch, cuff and waistband. 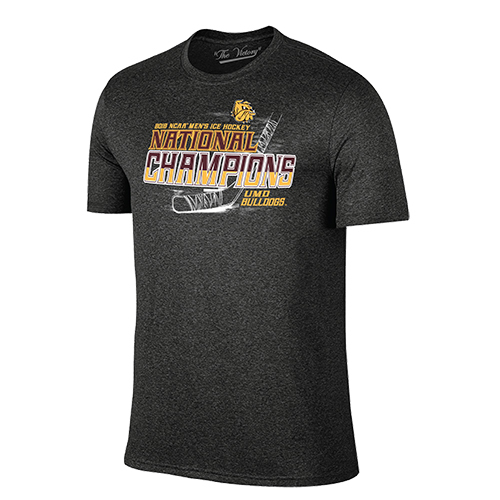 Features UMD and National Championship screenprinted graphics. 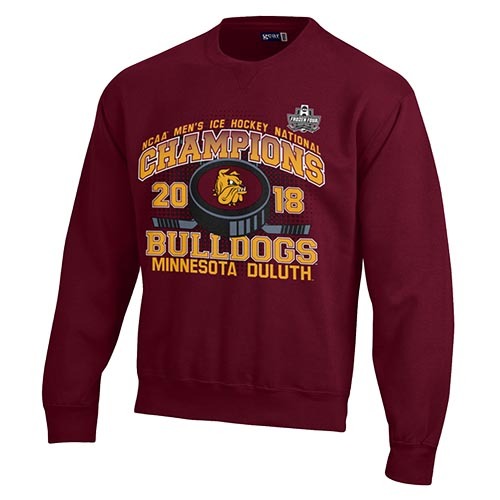 Please select option for NCAA 2018 Hockey Championship Bulldogs Sweatshirt by Gear.